MEXICALI, Mexico, July 16, 2011 – Carlos Acosta of silver medalists Puerto Rico was elected as the Most Valuable Player of the inaugural U-19 Boys’ Pan American Cup won by Brazil on Saturday night at the State Auditorium of Mexicali. Another Puerto Rican awarded during the closing ceremony was Luis Bertran as best digger and best libero. The crowned champions Brazil had four players receiving individual awards as Joao Ferreira and Alan Souza finished as best spiker and best blocker respectively, Thiago Veloso concluded as best setter and Rogerio Carvalho received the trophy as best receiver. Brandon Legall of Trinidad and Tobago was the competition’s best scorer and best server. 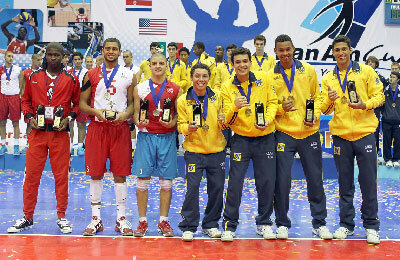 The awards were presented by NORCECA’s authorities and by members of the tournament’s Organizing Committee.